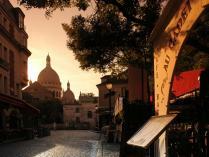 Guided tour of Montmartre with a licensed guide. Paris on the Way organizes visits of Paris and its monuments. 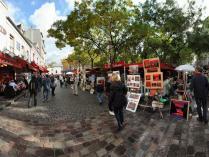 A village in the city: the artistic soul of Paris. Painters, portrait artists, caricaturists, silhouettists: the Place du Tertre, an open-air artist studio. Religious Montmartre: the basilica of the Sacré Cœur, a monumental protector with an amazing view. 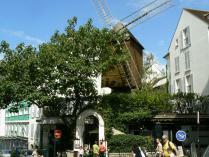 Montmartre the joyous: the Moulin de la Galette, the Lapin Agile, the wine festival…folk traditions. 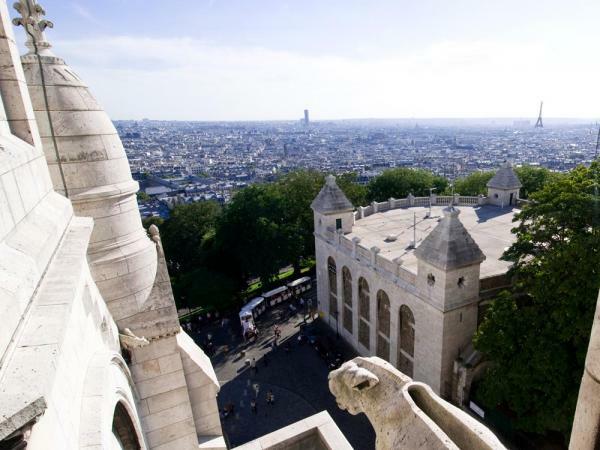 This hill (“la butte Montmartre”) located in the 18th arrondissement boasts a magnificent panoramic view of Paris. With its narrow, winding streets peppered with steep stairways and charming lampposts, and its cobbled squares filled with watercolor painters and sketch artists, Montmartre has become a picture postcard of Paris. Yet it is also the hillside vineyard on the rue des Saules, the festive Moulin de la Galette where Renoir came to paint in the open air, and the Bateau Lavoir studio…. Stroll with your guide through the sinuous streets of the tallest hill of the capital, just like the artists since the end of the 19th century – Picasso, Renoir, Toulouse-Lautrec and Utrillo. You’ll sense the contrasts of this legendary, devoted, and picturesque place where wine flowed freely and romance alternated with madness.